It is the last day of the month and therefore time for me to get my blog post out. 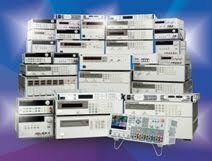 I want to build on Gary's latest post concerning the new Agilent/Keysight AC6800 AC Sources (Click Here). One of the key features that Gary mentioned is inrush current testing. My colleague Russ did a video on inrush current testing for the launch. This gives you a little bit of perspective on why you want to do the testing and gives some good tips. When you do inrush current testing, you typically want the highest value that the current has reached when the power is enabled. The AC6800 has a peak hold current value that will store this value for you. The unit stores the highest current value it has measured since that value was last cleared (either manually or from power on). One key thing to remember is to always clear out the peak hold value before doing your measurement so that you know that your measurement is up to date. The AC6800 can synchronize the enabling of the output to a user defined phase. When you specify the phase, it will enable the output at that phase in the sine wave (anything from 0 to 360 degrees). The combination of the peak hold measurement and this phase synchronization are what make this testing possible. That's about it for me this month. Please let us know if you have any questions in the comments.